The Green Animals Topiary Garden house is located in Portsmouth, Rhode Island not far from the mega-mansions of Newport. The Green Animal estate is nothing like the historical marble homes of the Vanderbilts and Astors, but offers something unique – the lust and colorful gardens. The small estate overlooking Narragansett Bay was purchased by Thomas E. Brayton in 1877. The estate contained a classic white clapboard home, farm out buildings, and seven acres of pasture and gardens. Mr. Brayton was treasurer of the Union Cotton Manufacturing Company in Fall River, Massachusetts from 1879 to 1920. The family used the estate as a summer cottage for many years until about 1910 when the family closed up the house, possibly due to the death of Martha Brayton (Mr. Brayton’s wife). When Mr. Brayton died at age 86 in 1939, he left the estate to his daughter, Alice, and son, Edward. Alice decided to make the estate her permanent residence in 1940 and named it “Green Animals” after the topiary gardens. At this time she winterized the summer cottage and moved the kitchen inside the home. Alice is a very remarkable woman. She never married, but was very active in her community. During the Great Depression, she helped initiate a relief program in Fall River to administer tickets for milk, food, and clothing based on family needs. She founded the District Nursing Association of Fall River and sat on several boards. She also supported many children’s causes as a result of her effort, there is a toy museum in her home. Edward sold his share of the estate to Alice for $1 in 1939. After moving to Green Animals, Alice published five books and was a contributing author to “Gardens of America.” Alice was very fond of the gardens and enjoyed her morning ritual of a daily walk through the gardens. She entertained frequently in the garden. Her most renowned party was Jacqueline Bouvier’s coming out party she hosted in the late 1940s where she rented a carousel for guest’s amusement. Alice allowed the gardeners freedom to design and cultivate. Alice enjoyed the fresh vegetables and fruits from her garden and only allowed the produce to be picked at its ripest time to be consumed that day. Alice lived at her home until her death in 1972. She left her estate to The Preservation Society of Newport County for future generations to enjoy. What makes the estate unique and a beautiful place to visit is the topiary garden. Mr. Brayton hired Joseph Carreiro, a Portuguese gardener, as his superintendent. 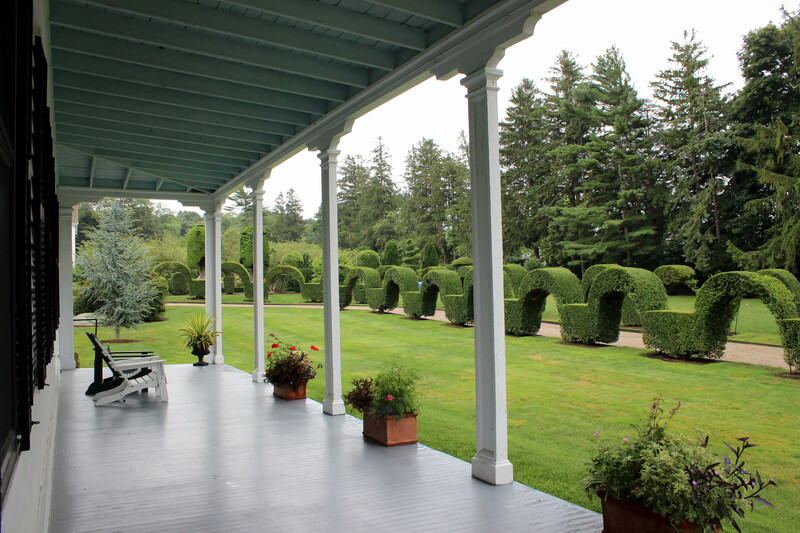 Carreiro was responsible for creating most of the present topiary up until his death in 1945. His son-in-law, George Mendonca, took over as superintendent and continued to care for and create new topiary until his retirement in 1985. The gardens contain 80 sculptured trees amongst the flower beds. Favorites include the teddy bears, a giraffe, and many more. The sculptures are made from California yew and English boxwood. The oldest topiaries are made of boxwood seedlings in 1912. Boxwood is a dense small-leaved native evergreen. Topiaries from the 1940s forward are made from California privet. Privet is a semi evergreen shrub that grows quickly. Many of the topiaries took decades to shape. Unfortunately, a few of the animals have been hit with a fungal infection. On the day that we visited the estate, it just started to rain. Despite the rain, the gardens were beautiful. I was excited to finally be able to take some pictures of the estate (you’re not allowed to photograph inside the mansions) and enjoyed the colorful and heavily scented flora. As you enter the formal gardens, you are greeted with the giraffe, camel, lion, and elephant amongst the colorful flowers. 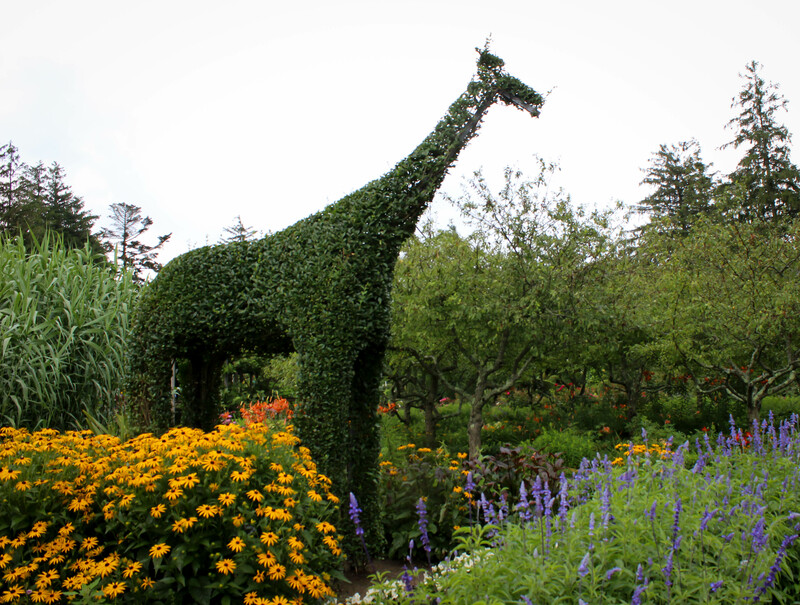 You’re walk through the orchard beds of crabapple trees and assorted perennials to the upper topiary lawn filled with many more topiaries, including my favorite – the teddy bears and baby giraffe. 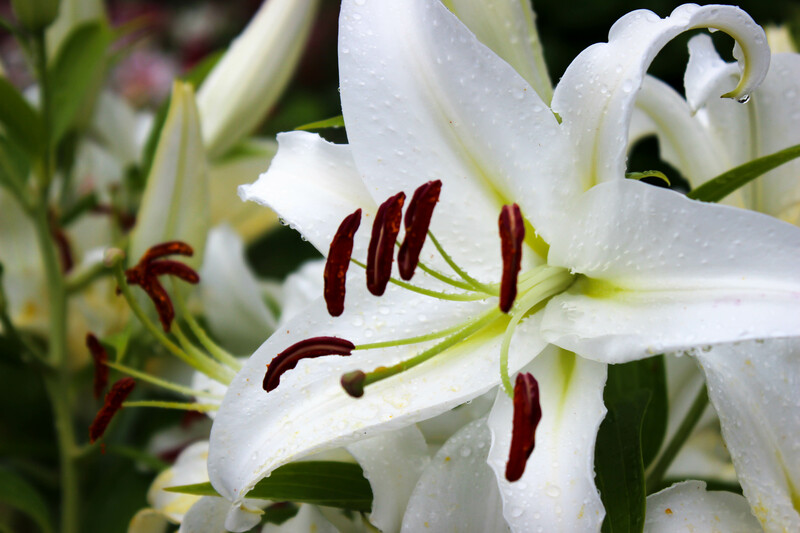 Further past the topiaries, you’ll find the award-winning dahlias and lilies and many more flowers. Personally, The Elms was my favorite house, but Green Animals is a very close second. Green Animals is a bit off the beaten-path compared to many of the mansions located on or near Bellevue Avenue. But, it is worth the 10 minute drive to see the beautiful gardens and glimpse at a different style home. For more information, check out http://www.newportmansions.org/documents/green_animals_living_art.pdf. 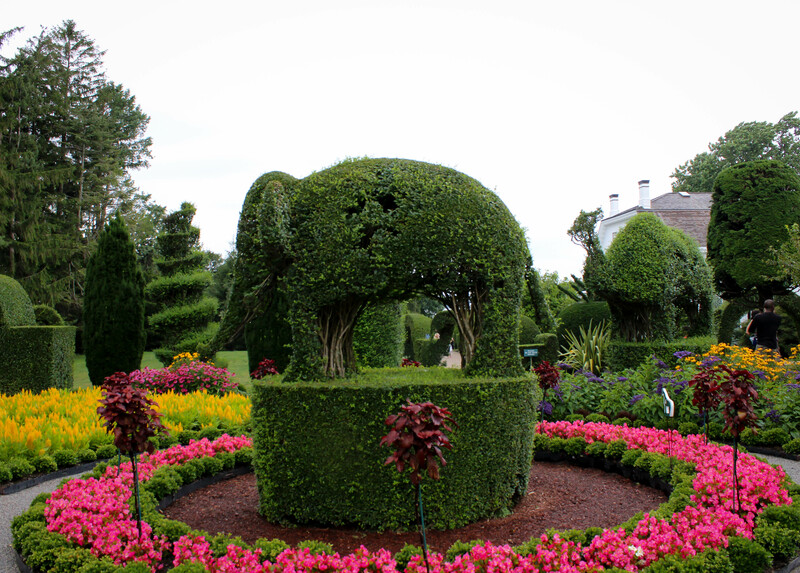 Have you been to the Green Animals Topiary Garden? Do you enjoy colorful gardens?